Knowing your strengths and weaknesses is an important part of being a quality candidate. Although you might think you know what these qualities might be for yourself, this exercise is more about what others see as your strengths and weaknesses. Perception is reality in politics, and knowing how others view you can be very informative. In this article, we present 23 questions you can use to evaluate yourself and, perhaps more importantly, for others to provide you with that insight. Now, obviously, people are reluctant to provide negative feedback to you directly or in person. That’s why we created an online tool you can use so that your friends, family, and colleagues can answer these questions anonymously. NOTE: You can add your email address to this link so that it automatically appears in the form. This will reduce data entry errors. To do that, simply add this to the end of the link: [email protected] (substitute your own email address for “[email protected]”). Make sure they enter YOUR email address, not theirs. This email address is where the answers will be sent. Collect the survey results and tabulate the responses. 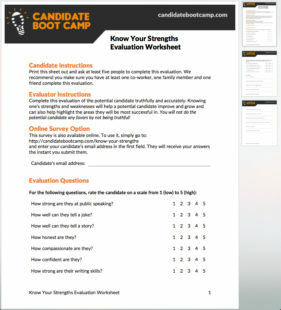 Here are a series of questions where candidates should rate their own strengths on a scale of 1 to 5. Taking an honest inventory of these strengths and weaknesses will help you during your campaign. You can focus more on things that are a strength. In areas where you may not be as strong, perhaps a supporter or surrogate can contribute. For the following questions, rate yourself compared to your friends, family, and network. How would you rate yourself (top, middle, or bottom) at the following? How do your leadership qualities compare? Where do you consider your overall temperament? How do your organizational skills compare? How involved are you in your community? Would you consider yourself to be generous? Do you have the life experience necessary for the office you’re considering? Are you willing to donate to your own campaign? Sometimes we need someone to tell us when we have spinach stuck in our teeth. As a political candidate, you need honest, unvarnished feedback about your strengths and weaknesses. That’s the only way to build a winning campaign strategy. 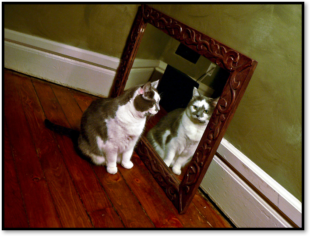 It’s not easy to look at yourself critically and admit that something may be a weakness. But in the end, your campaign will be better off and your chances of success greater if you can focus on the things you do well and have others contribute in areas you perhaps don’t. We’ve created two free downloads to help with your assessment: One is a self-assessment worksheet and the other is a sample of a completed worksheet. Just enter your name and email in the form below and we’ll email you a download link.